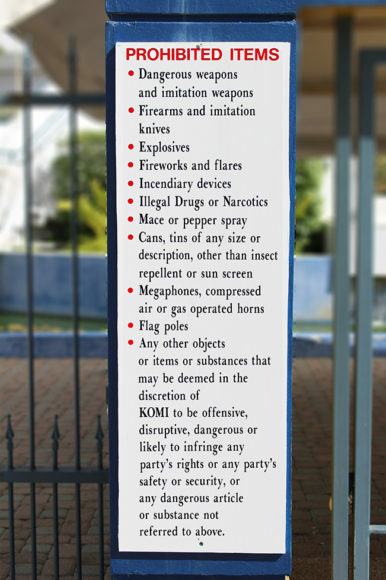 For the safety and security of our guests, the following items are not permitted into the Kensington Oval. Any other objects or items or substances that may be deemed in the discretion of KOMI to be offensive, disruptive, dangerous or likely to infringe any party’s rights or any party’s safety or security,or any dangerous article or substance not referred to above. The lists represent the most common items attendees want to know about. All items may not be listed and will be at the discretion of law or security at the gates. Additionally, please note that each gate which serves as an entry point for attendees to the Oval or the rest of its facilities, will be outfitted with a list detailing such prohibited items as shown below in the image.